1. The first section addresses the Sephardic book and illumination, and its its production in the Iberian Peninsula from the 13th to the 15th century. 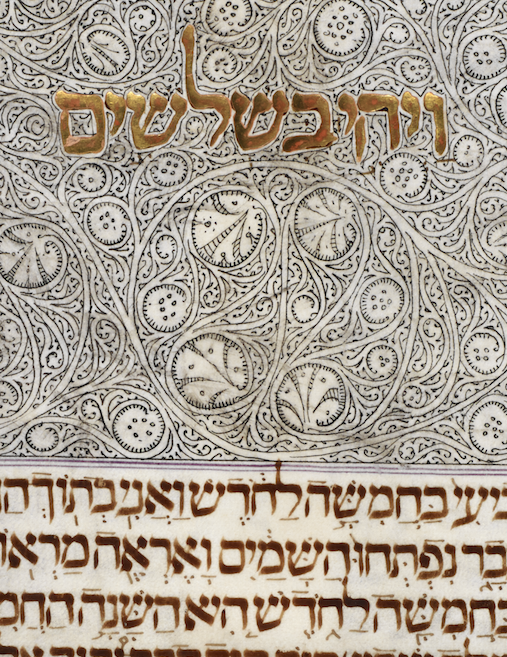 Using as starting point two related manuscripts from BNP (National Library of Portugal), it will address the broad chronological and stylistic range of Jewish miniature production in the Peninsula. The highlights of this section are the Bible of Cervera (BNP Il. 72), copied and illuminated in Navarra between 1299 and 1300, and the facsimile of the Kennicott Bible(Bodleian Lib., MS Kennicott 1), copied and decorated in A Coruña in 1476. 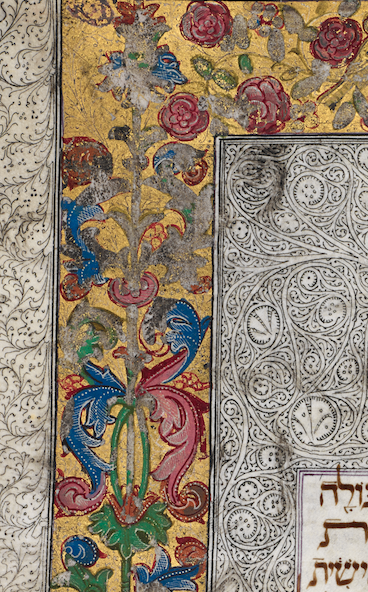 It shows how an older manuscript can be used as a model and inspiration for the production of another almost two centuries later.These two works also exemplify the dialogue between Sephardic illuminators and their surrounding culture, as they integrate in their work forms inspired in Gothic and Late Gothic styles, as well as Peninsular islamic and mudejar art. 2. O segundo núcleo é dedicado à Escola de Lisboa de iluminura, que esteve ativa no último quartel do século XV. O valor artístico e a relevância histórica destas iluminuras têm passado francamente despercebidos aos historiadores de arte portugueses e, consequentemente, à maior parte dos cidadãos interessados em matérias culturais e artísticas do passado. Através do recurso a fac-similes, fotografias e imagens digitalizadas destes manuscritos, nenhum dos quais se conserva atualmente em bibliotecas portuguesas, pretende-se destacar a idiossincrasia desta escola de iluminura e apresentar as suas principais caraterísticas em termos plásticos. Estas obras demonstram o elevado grau de acomodação cultural dos judeus portugueses, nomeadamente os judeus de Lisboa, e o apreço que tinham pelo livro religioso de aparato, à semelhança das elites cristãs da mesma época. 2. The second section is dedicated tho the Lisbon School of Illumination, active during the last quarter of the 15th century. The historical relevance of these illuminated works has been widely underestimated by Portuguese art historians, and is therefore virtually unknown for the larger public interested in cultural, artistic and historical subjects. Using facsimiles, photos and digital images of these manuscripts – none of which are currently in Portuguese libraries – this section presents the artistic peculiarities of this illumination school. These codices are evidence not only of the Jewish cultural accommodation, namelyin the Lisbon Jewish community, but also of the appreciation for deluxe religious books, which it shared with the Christian elite of that period. 3. O terceiro núcleo visa apontar sinais da interação cultural e artística entre judeus e cristãos em Portugal no final da Idade Média, tanto em termos de cultura científica e teológica, como em termos artísticos, em particular ao nível das relações entre a iluminura judaica portuguesa tardo-medieval e a iluminura cristã da mesma época. Apesar de ser possível identificar vários pontos de contacto, o enfoque da exposição recai no campo da iluminura cristã, em particular na decoração em filigrana monocromática e nas cercaduras fito-zoomórficas com enrolamentos acânticos. A pertença a um mesmo horizonte cultural e artístico, associado ao consumo do livro de aparato, explica as afinidades existentes entre os livros cristãos e os livros judaicos. Importa destacar, no entanto, que entre as décadas de 1470 e 1490 o foco mais rico de produção de iluminura feita em Portugal foi, precisamente, a Escola de Lisboa de iluminura judaica. Nessa altura os manuscritos iluminados cristãos de maior valor artístico eram livros importados da Flandres e do Norte de França, sobretudo Livros de Horas. 3. The third section deals with the cultural and artistic interaction between Jews and Christians in the late Middle Ages. This is addressed not only from the perspective of science and technical knowledge, but also from an artistic point of view, by comparing the Christian and Jewish miniature production in Portugal during the 15th century. Although there are many common characteristics, the exhibit will focus on the monochrome filigree decoration, the borders with floral and zoomorphic motifs and acanthus leaves. The similarities between Jewish and Christian book decoration result from a common cultural and artistic background and a shared taste for luxury books. It is worth noting that the Lisbon School represents a high point in Portuguese miniature production between the1470s and 1490s. At that time the Christian illuminated luxury manuscripts, such as books of hours, where mainly imported from Flanders and the North of France. 4. The fourth section of this exhibit is dedicated to the printed book, introduced in Portugal by the Jews. 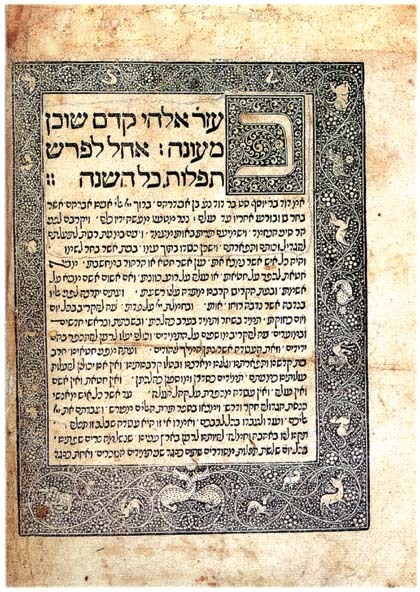 The first Portuguese incunabula was a Hebrew Pentateuch printed in Faro in 1487 in the workshop of Samuel Gacon, preceding by two years the publication of the first Portuguese incunabula in the city of Chaves. It was followed by the publication of several Hebrew books between 1487 and 1495, in Faro, Leiria and Lisbon. This reveals the existence in Portugal of a large market for Hebrew books, particularly those of religious nature. 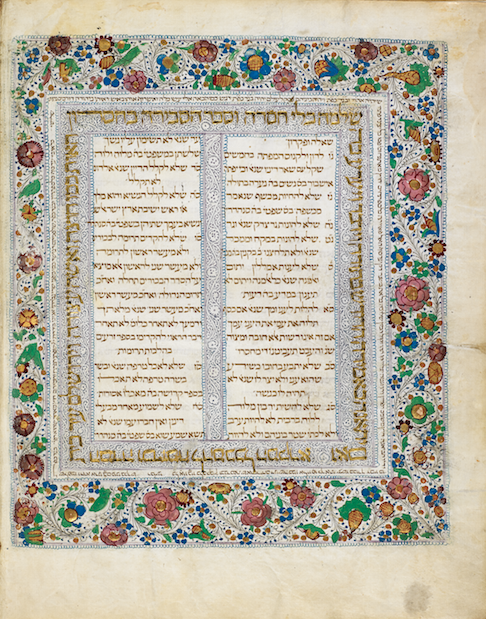 It is this active interest in books, proportionnaly much higher than that of the Christian community, which accounts for the elevated production of Jewish books, either in printed or manuscript form, in the last third of the 15th century. 5. The fifth and final section is dedicated to the Jewish and Christian religious controversy in Portugal, derived from religious radicalism in both sides, and which brought forth considerable hatred and lack of understanding between both communities. Thus, in the same period we find multiple signs of social, cultural and artistic interaction between the Portuguese Jewish and Christian communities, there are clear evidences of exclusion and radical behavior in the religious discourse. These contradictions, common to complex multicultural societies, where the root of the two paths followed after the events of 1496/1497: the conversion or the exile of the Jews. Aware of the problems any of these options would bring, the rulers of that period contributed to the enforcement of the first option, but at the same time, did all they could to avoid the second. Com esta exposição, portanto, pretende-se divulgar junto do público um património que representou um momento alto da arte e da cultura judaica, e portuguesa, do século XV. Um património que atualmente é de difícil acesso e que se encontra disperso, pelo que esta exposição constitui uma ótima oportunidade de o conhecer melhor. This exhibit aims to promote to the public an heritage representative of a flourishing moment for Portuguese and Jewish culture and art of the 15th century. An heritage which is currently dispersed and of difficult access, and which can now be better understood and known by both the academia and the larger public.